Investing in an automatic swimming pool cover delivers benefits on five important fronts: safety, convenience, pool cleanliness, water conservation, and energy efficiency. Collectively, these benefits can maximize the lifespan and the value of your backyard oasis and help you save money on pool ownership. Automatic pool covers consist of the cover material—typically vinyl—on a motor-driven device that works on a simple pulley principle, easily opening and closing without any manual labor. The installation includes a large reel at one end of your pool. Two straight tracks along the pool’s long sides house the mechanism’s rope and the pulleys. The cover opens when the rope winds up, and it closes when the rope unwinds. What makes an auto cover such an attractive asset is how easy it is to use: With just the push of a button or the turn of a key, the cover retracts and simply rolls up into itself—appearing and disappearing at your wish. It provides a snug barrier between the pool surface and everything outside of it. Adding one of these automated systems to your new or existing pool does require a major upfront purchase. Depending on your pool dimensions and the model variety, expect a standard auto cover to add upwards of $8,000 to $12,000; customized versions for special pool shapes—such as free-forms designs—will run more. However, the cost can pay off for you and your family in both immediate and long-term value. Let’s take a look at the key ways how. No one likes looking at dirty pool water or the hassle of cleaning their pool. Because it blocks entry of virtually all dirt and debris from entering your pool, an automatic pool cover ensures you have a cleaner swimming environment. Yes, when you take off the cover to enjoy your pool, some dirt can sneak in. However, the more often your pool remains covered, the less dirt you’ll have to deal with overall. Imagine, if your pool is open for only two hours a day; that’s a fraction of the time that dirt, debris, pollen, leaves, twigs, bugs, grass clippings, and a host of other contaminants can find their way into the water. The result: less time and effort needed for both manual and automated cleaning. You will cut the time running your automatic pool cleaner and the physical effort using a pool net to scoop out debris. It also means less time for filtration cycles. You can run your pool pump—which powers water through the filter—much less each day. For example, if you typically run the pump eight hours, it may suffice to run it only four to six hours—saving both energy and wear on your pump. In a similar vein, a pool cover—and the cleaner water it produces—helps extend the lifespan of your filter. Since there will be less dirt overall for your filter media to trap, the filter operates more efficiently. Even better, the time periods between the filter cleanings will be longer. Each cleaning causes some wear on the filter’s media, so a slower rate of cleanings equates to a longer product lifespan. Fewer cleanings save you the time and effort as well. 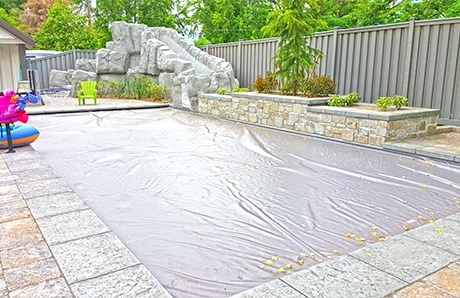 Automatic pool covers are a great way to stave off water loss from your pool. According to the U.S. Department of Energy, evaporation is responsible for up to 70 percent of water loss in pools and spas. It’s not uncommon to see anywhere from one-quarter of an inch to one-half an inch of loss per day on your pool water line. Over the course of a week, that adds up to a significant 2 to 4 inches. If your pool’s water level is unexpectedly lower than you think it should be, a likely day-by-day cause is evaporation. There are three primary causes: high outdoor temperature, lack of humidity, and exposure to outdoor elements like sun and wind. It’s impossible to control exposure to the elements completely. However, a pool cover is a highly efficient means of taming the effects of Mother Nature. This barrier greatly reduces evaporation by blocking the heat that comes from direct sunlight on the water. It physically blocks wind that would otherwise hit the pool surface and produce water loss. And even if the air outside is particularly dry, a cover helps alleviate the effects. Using a well-fitted pool cover can make a huge difference. One university study suggests that by using one, you can cut water loss as much as 95 percent! When summer fades into fall and then into winter—even if you live in a part of the country where it stays warmer longer—it takes more gas or electricity to run a gas heater or a heat pump to keep pool water at a comfortable temperature. However, a pool cover can help extend your backyard swimming season while also saving money. You don’t want to pay for extra energy costs when it’s chilly outside, and a pool cover helps preserve some of the warmth generated by your heater. Water evaporation is the single biggest cause of energy loss, and as noted above, a cover can significantly cut evaporation. Even in the summer, nightfall in certain geographic regions brings a dramatic dip in temperature; in these cases, covering a pool when the sun goes down can help cut energy costs by minimizing evaporation. 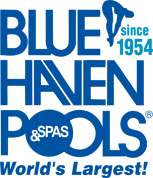 As a result, a cover can lower pool heating costs by up to 70 percent, and they may save as much as 50 percent on overall electricity costs. An auto cover can help lower your electric bill in another way: As explained above, by keeping your pool cleaner, you will need to run your pool cleaner for less time—saving energy. And cleaner water means shorter filtration run times, so your pump won’t have to operate as many hours per day to circulate water through your filter. Safety is a concern for pool owners with young children at home, as well as their visiting friends. A variety of safeguards are available, including fences, door alarms, and pool alarms, as well as encouraging swim lessons and enforcing strong pool rules. Remember: There is no substitute for proper adult supervision. However, one of the best physical barriers you can put in place to boost safety is a sturdy automatic pool cover. Because automatic pool covers are strong and durable, they offer the highest degree of safety when it comes to keeping people—especially children—and pets from falling in. In cold regions where winter temperatures drop below freezing, pool owners have to winterize or shut down their pool for several months. Typically, they will use their automatic cover as a winter cover for this process. However, you can use one for safety throughout the spring and summer when the pool is open and in use. Doing so is especially important if you have young children with access to your backyard or when they are near the pool for any period without an adult around. With children at home, a smart move is to choose a cover model that offers an on/off function that works only with a key. That way, you can keep the key to ensure control when the cover is on or off the pool. The strength of automatic pool covers vary, but most can support the weight of several people at one time. However, you should never walk onto the pool cover or use it for recreational play in any way. Warn children that the pool cover is not a place to play. However, parents can gain some peace of mind knowing that if an accident occurs, and a child falls onto the cover, it should prevent them from getting into danger—or even getting wet. Likewise, if you have pets that use the backyard and do not swim or do so poorly, a pool cover is a reliable means of keeping them safe as well. Mesh and solid tie-down pool covers offer many similar benefits as an auto cover, but they take a lot of work to roll out and put on your pool and to remove from your pool. You have to manually roll or spread them out over the water, and tie or anchor them down around your deck. To open up your pool for use, you have to drag the cover off, remove any ties or anchors from the deck, and fold and store the cover. So, one of the greatest rewards of investing in an automatic pool cover is ultimate ease: They essentially store themselves—usually in less than a minute! 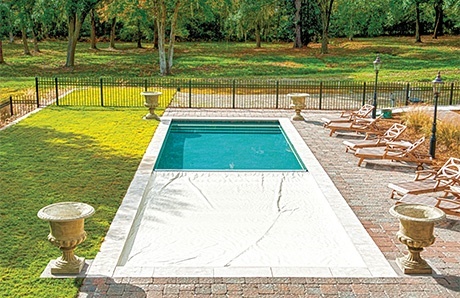 Your automatic pool cover conveniently puts itself away whenever you are ready. It’s worth noting that convenience can lead to more regular use. Like any device, if using it requires a lot of effort, it’s human nature to use it less frequently. And the best cover—if not on the pool—won’t do any good. With an auto cover, that potential concern never comes to fruition. By inherently being so easy to use, an automatic pool cover helps ensures you will use it as intended and a regular basis, day after day. The result is that you maximize the benefits that a cover can deliver. An automatic pool cover makes sense for a variety of safety and budgetary reasons. Yes, it will significantly increase your budget for a new pool or a renovation. But it has the potential to offset maintenance costs over the years. These heavy-duty covers also help create peace of mind, especially in homes where you cannot monitor children and pets 100 percent of the time. And then there’s the sweet convenience of technology that provides safety without the hassle and sweat of manually taking a cover on and off. Just flip a switch, and watch as the cover seals your pool. And while you cover your pool, its saving money on heating costs, minimizing water loss from evaporation, and keeping the water clean for the next refreshing dip in your backyard resort.